I've looked at a couple of threads and I can't seem to find one where you guys rate the 650 exhausts you bought. Give us new buyers some advice on a nice sounding exhaust that won't break your pocket please. Have a Two Bros M2 VALE on my 2011 650R, gives the bike a deep throaty sound with the baffle out. Might be too loud for some people's tastes. I'd say the loudest pipes you can get on these bikes are going to be from M4 or Two Brothers. Avoid the Carbon Fiber cans from Two Bros though, stick with the aluminum or titanium canister. Since you said "for the money', the stock exhaust wins hands down. The Ninja isn't known for it's sweet exhaust note. The ones I have had the displeasure to be riding behind sounded like Kawasaki Lawn mowers. Operators of Kawasaki engine lawn mowers wear ear muffs when operating them because even they don't like the sound. 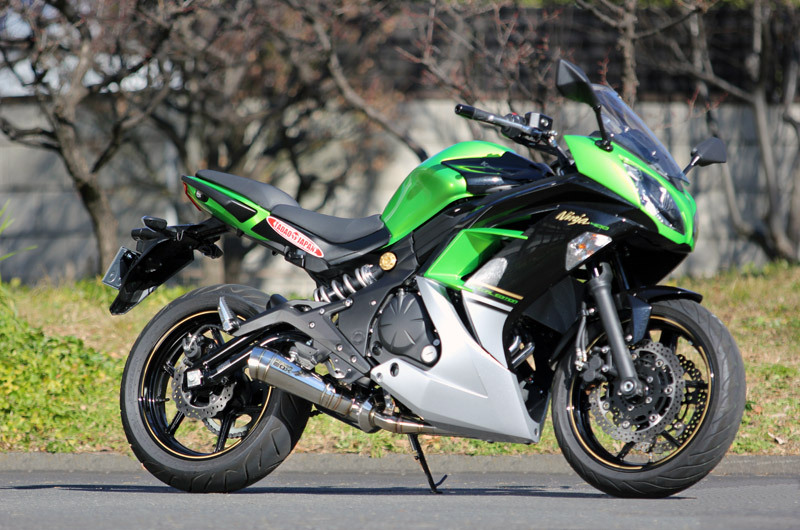 That SP Tadao Power Box Exhaust sure does look sweet though. I need some help in understand the allure of aftermarket exhausts. This isn't meant to be condescending, just legitimately looking to find the reasons why people go for these. Me, personally, the less attention I attract the better. People ride bikes or buy sport cars or jacked up 4x4s for many different reasons. The ones that make them louder when HP gain is negligible usually do it to attract attention. It is kind of like the male peacock prancing around in all his glory to attract a mate. Bikes, Sport Cars, and jacked up 4x4s attract the type of female more willing to mate than wait. Last month a installed a Leo Vince full system that I got used at a good price. I'm pretty impressed with the sound, more deep, little bit louder than the stock exhaust even with the DB killer installed. Since I'm from Quebec Canada, we have laws against loud exhaust so I had no choice but to put a DB Killer. Also I gain a little bit more power and torque to the bike, I can really complain about that. Overall I would recommend to make the switch especially if you have a good price for an exhaust like i did. My bike came with a Muzzy muffler. Is a bit loud for my tastes but I'm too cheap to buy a stock muffler. I did repack it with some ceramic cloth rather than fiberglass but the sound remained the same. That SP muffler looks killer though. I wonder if it would work on an '07 but I'd have to hear it first. I have a stock unit from an 06 that only has about 3600 miles on it. Ill trade you for the muzzy if youre interested. dont the exhaust on these things stay pretty much the same? Im not sure where but I seem to remember someone saying that they all bolt up to one another as long as some new muffler brackets can be fabbed up. I'm looking for HP man. I don't think an app thru my smart phone is gonna help me go faster. As for the exhaust trade, I'll stay with my stock 2016. I still haven't taken it in to the stealership for the 600 mi robbery. I have 402 mi on it. I was looking for a slip on exhaust but I read they only make full exhaust systems for the 2012 on models. No slip ons. Don't have money for full exhaust. Now I'm looking for a rear seat cowling. Replaces the rear seat with a plastic mold. Clean look. Saw one on ebay but was $90. I can't see paying almost a hunnert for a piece of plastic molding. I'm asking around if I can use another bikes cowl on the 650R. The ZX6 cowling only costs $22 bucks. Anyone know if you can use another model cowl on the 650R? Mistake on the exhaust trade XxGRYMMxX!!! Thought that was for me! I'm still looking for a cowling anybody??!! !